Yesterday afternoon, Thursday May 31st, Loro Parque inaugurated a new, never-before-seen exhibition. 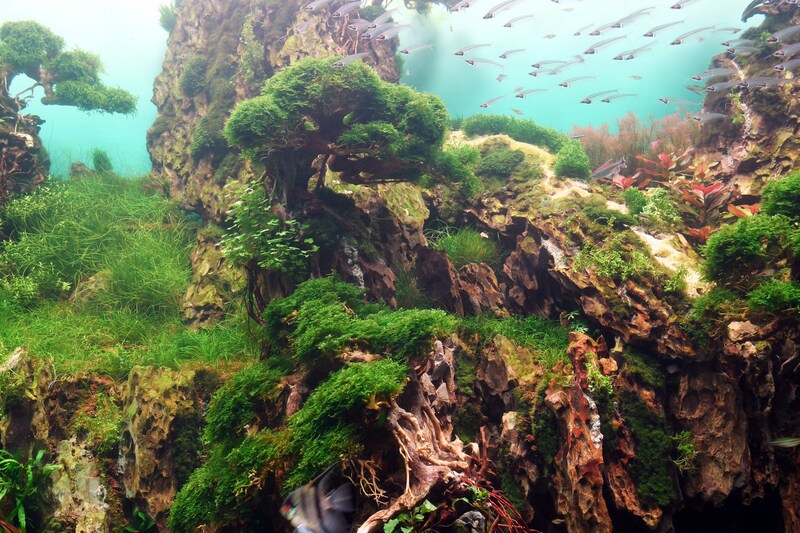 It’s an unprecedented landscape aquarium, the first of its kind to be built in the world. Called the Zen Garden, it’s inspired by Japanese gardens and the majestic mountain ranges of Asia and can be found at the AquaViva exhibition, home to the most spectacular jellyfish. More than 200 people, including political and civil authorities and representatives of the business world, were the first to enjoy this submerged garden that amazed everyone present, who were unanimous in appreciating the great work done in the installation. 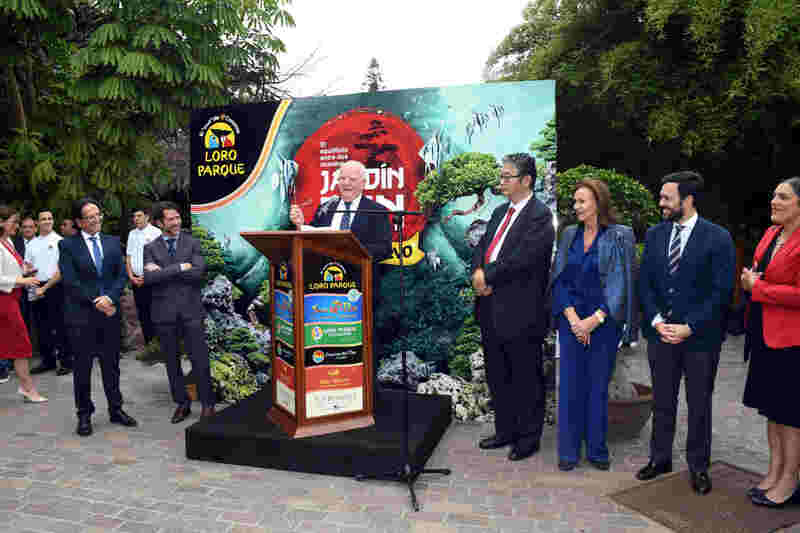 Special mention should be made of the presence of the Japanese Consul from Las Palmas de Gran Canaria, Takeshi Nakajima, who accompanied the authorities during the opening ceremony. 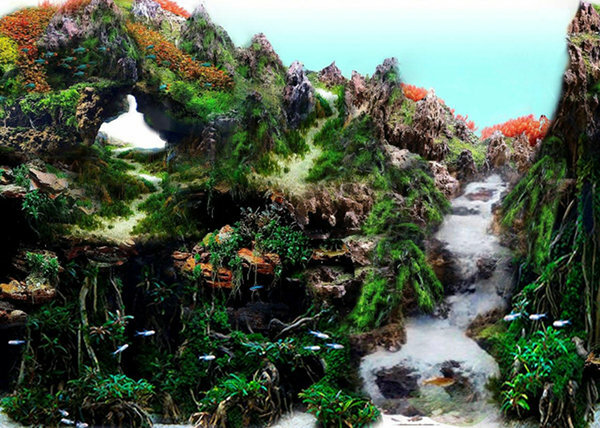 This unique space has been designed by Yago Alonso, an outstanding student of Takashi Amano, the famous watercolorist and landscape photographer of international renown, who invented this type of submerged landscape using gardening techniques inside aquariums. Some characteristics that make it special are the use of fresh water in the installation or the presence of species of animals and plants in its interior, uncommon and yet fascinating. Exotic fish, snails and small shrimp live together in this space where the main protagonist is the balance between flora and fauna. The harmony and stability of the Zen Garden is such that it is self-supporting, maintaining itself and continuing without the necessity of the intervention of the human hand once the space has been designed. This factor is considered a key goal in the art of aquascaping, a technique used in its creation. From today, Friday, June 1, all our visitors will be able to enjoy this innovative installation in the AquaViva exhibition, with which it blends in perfect harmony due to its exotic atmosphere. It’s only a matter of days before Loro Parque inaugurates its new exhibition, a unique aquarium landscape where the main protagonist is the balance between the flora and fauna that coexist in its interior. Called the Zen Garden, it will evoke the beauty of the perfect balance inherent in the planet’s ecosystems, which is unfortunately being lost in the natural environment. Thus, the synergy between botany, multidiscipline aquarium specialities and light that characterises this innovative exhibition will perfectly represent the wonders of nature. Due to its exotic atmosphere, and ideal to accompany it in perfect harmony, the Zen Garden will be located in AquaViva, home of the most spectacular jellyfish from tropical seas. This aquarium landscape is unprecedented as it is the first of its kind to be built in the world. Some features that make it special are the use of fresh water in the installation or the presence of plant species inside, rare and yet fascinating. Exotic fish, snails and small shrimp live together in this space where the main protagonist is the balance between flora and fauna. The space is dominated by shadows, an element highly valued in Japanese culture as an aesthetic feature because they are considered to awaken the imagination of the observer through covert rather than overt exhibition. Thus, this water garden invites visitors to discover an exhibition of a delicacy and spectacularity never before seen. Through this innovative underwater garden, Loro Parque, as a wildlife conservation centre, wants to emphasise the importance of maintaining the balance of the natural environment ecosystems that represent the wonders of nature. The exhibition will be open to the public from Friday, June 1, after its official opening on Thursday, May 31. 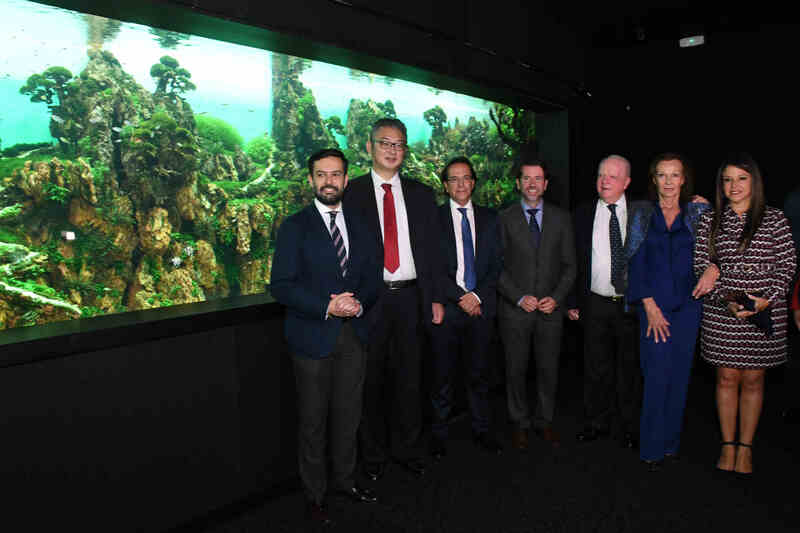 A new, unprecedented and internationally important exhibition, which will take the form of a landscape aquarium, opens at the end of May in Loro Parque. This Japanese-style underwater garden is the first of its kind to be built in the world and awakens feelings reminiscent of Atlantis, the famous legendary underwater city. With this never-before-seen commitment, the Loro Parque Company consolidates its dedication to offer its visitors innovative proposals, which are unique in the world and always designed with excellence as a prerequisite. 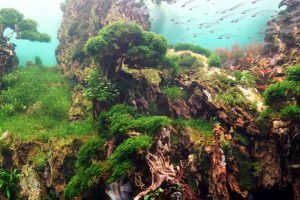 This innovative underwater exhibition is inspired by Japanese forest landscapes and the majestic mountain ranges of the Asian mountains and has been created using the ‘aquascaping’ technique. Unique in the world for its complexity, innovation and beauty, it will convey depth and balance in the purest Zen style and will captivate fans of flora and fauna alike. It stands out not only for its complexity, but also for the species used in its creation and for the distribution of the plants and their luxuriance. The latter is a key aspect, as many of them have to adapt to the growth of their leaves in a submerged space, evoking a level of aesthetics cared for to the millimetre, similar to the art of pruning and maintaining a bonsai. Thus, visitors will marvel at the complexity of the flora, totally alive and in all its splendour, as the display design has black-balled any inert element that is simply decorative. Through this innovative underwater garden, Loro Parque, as a wildlife conservation centre, wants to emphasise the importance of maintaining the balance of the natural environment ecosystems that represent the wonders of nature. The exhibition will be open to the public from Friday, June 1, after its official opening on Thursday, May 31. 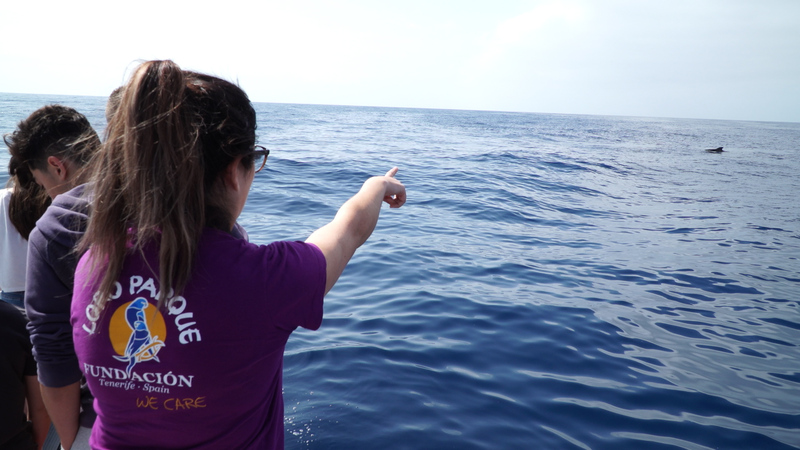 Throughout April, the Loro Parque Foundation carried out the ‘Discovering Our Sea’ project, which aims to raise awareness of the extraordinary richness of Canarian waters and the need to protect and conserve them. The initiative is aimed at secondary school students and involved different schools on the island of Tenerife. The activity was carried out in three sessions, on different days, and was led by the Foundation’s educators, who used a dynamic of play and participative work with the aim of encouraging interest in the students and to generate a link that promotes the protection of the marine environment and nature in general. 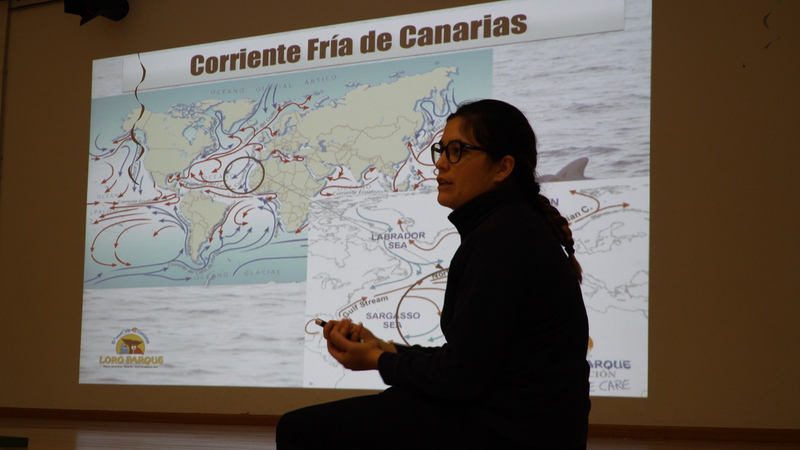 The first part took place in the classroom at the individual schools, the second in Loro Parque and the third on board the Freebird One catamaran. The ‘Discovering Our Sea’ project seeks to: broaden young people’s knowledge of the archipelago’s oceanographic characteristics that make it a biodiversity hotspot; to discover and teach them to appreciate the immense wealth of the islands’ marine fauna, especially the cetacean species that frequent the Canarian coasts; to improve their awareness of the main problems affecting the conservation of the marine environment; and to develop attitudes of respect, care and responsibility for the conservation of the oceans, by strengthening and promoting the use of more sustainable alternatives that reduce the negative impacts of human activity therein. 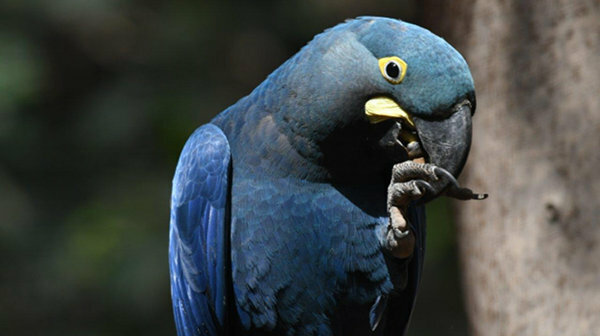 This Loro Parque Foundation initiative is particularly important given the geographical situation of the Canary Islands, which, together with their oceanographic peculiarities, bring together tropical and subtropical species and temperate water species in their surroundings. The proximity of bathypelagic and abyssopelagic environments on the coasts makes the archipelagos of the Macaronesian region large oases in the middle of the north-south migratory routes, which favours the presence of the greatest diversity of cetaceans in the entire Atlantic Ocean. However, these characteristics make oceanic islands more susceptible to various threat factors, such as climate change, pollution or over-fishing, which adversely affect the protection of the oceans and, in particular, the degree of conservation of certain species. 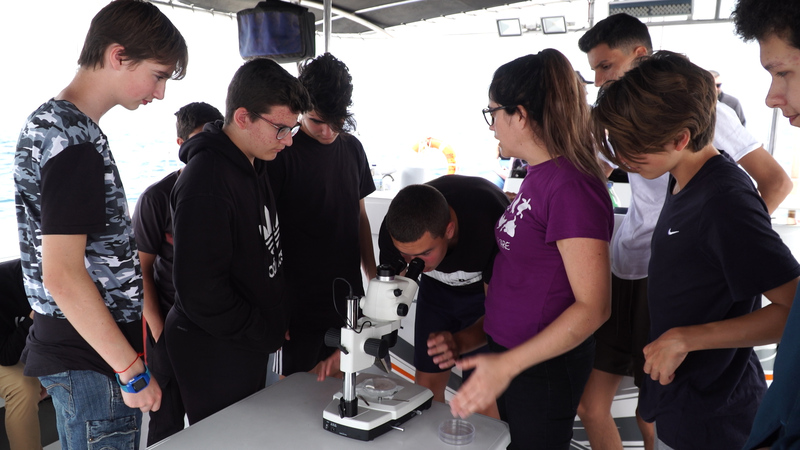 Preventing the deterioration of the marine biodiversity of the Canary Islands is only possible if its unique richness is known and appreciated, which is why environmental education plays a fundamental role in favour of the conservation of this submerged ‘treasure’, which is as beautiful as it’s fragile. 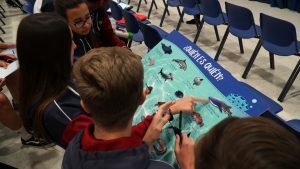 That’s why the Loro Parque Foundation, through ‘Discovering Our Sea’, aims to involve Canarian schoolchildren to improve their knowledge of the characteristic marine heritage that surrounds them, so that they can be its champions and promote attitudes of respect that result in fostering their conservation and the sustainable use of their resources. Thus, the Foundation continues to implement educational projects that promote the protection and conservation of nature, in line with the work that has defined its efforts since its creation in 1994. Aligned with the principles of Loro Parque, a wildlife conservation centre that makes its existence possible thanks to its funding, it has already allocated more than $18,000,000,000 to different ‘in situ’ and ‘ex situ’ conservation projects and has managed to save nine species of parrots from extinction. Judging by the dozens of aquariums around the country offering Mother’s Day programming, tens of thousands of American moms appear set to spend their special day getting a front row seat to the majestic and awe-inspiring creatures of the sea. For good reason. A trip to the local aquarium is something the whole family can enjoy, with sea life giving moms a well-deserved break from entertaining the kids. As a committed conservationist, I understand that this mission has a certain emotional appeal. But upon further examination, emptying aquarium tanks would have a negative impact beyond just eliminating the joy of visiting an aquarium. It would set back the conservationist cause, not advance it. Aquariums are arks of hope for the countless marine wildlife threatened by ocean pollution and overfishing. There is an island of plastic garbage twice the size of Texas floating off the coast of California, one of five massive garbage islands covering the globe. A Plymouth University study finds plastic pollution affects at least 700 marine species, and some estimates suggest that at least 100 million marine mammals are killed each year as a result. All three species of bluefin tuna are so endangered by overfishing that their recovery is virtually impossible. New Zealand’s Maui dolphin and West Africa’s Atlantic humpbacked dolphin could disappear within a decade. There are more than 135 endangered shark species; the number of scalloped hammerhead shark, found at the New Jersey aquarium, among others, has decreased by 99 percent over the past 30 years. Roughly 15 percent of aquarium species are threatened or endangered. Most aquariums have robust rescue programs, where these threatened animals can find a safe harbor, with conservation and research as key missions. Once rescued, aquariums can study these species and make a real impact in saving them. There are 115 reintroduction programs, 40 of which focus on threatened or endangered species, at American zoos and aquariums. So far this year, SeaWorld Orlando’s Animal Rescue Team has rescued 30 manatees, which are returned when rehabilitated. In total, SeaWorld has rescued more than 31,000 animals and published more than 300 scientific studies. Research conducted by aquarium scientists also informs conservation efforts and exhibits. 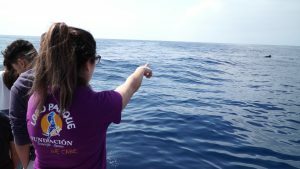 Last year, Georgia Aquarium scientists successfully performed health assessments on endangered whale sharks for the first time ever in Indonesia’s remote Cenderawasih Bay. During their recent visit to St. Helena, scientists studied whale shark movements and the impact of plastic pollution on their livelihoods. This information helps inform conservation efforts and the whale shark exhibit at Georgia Aquarium. Perhaps the biggest benefit aquariums have in advancing conservation is by inspiring people to act. Aquariums offer ordinary people the extraordinary opportunity to see fascinating sea life up close. This is vital to generating the public support necessary for conservation efforts. To generate support for conserving sea creatures, people must deeply appreciate them. But to appreciate them, people must first know them. Aquariums offer people this introduction. To do the most good, aquariums must be held to the highest standards of animal welfare. The American Humane Conservation Program furthers this goal by certifying that animals in participating zoos and aquariums are healthy, positively social, active, safe and living with proper light, sound, air and heat levels. These standards are set by animal science experts, providing the third-party validation of humane treatment and positive welfare that an increasingly discerning public is demanding. Like most mothers, I recognize the indescribable bond that children have with animals. Weakening this bond by returning aquarium inhabitants to the sea would also weaken the conservation movement. Potential protesters today should think about this before acting on emotions. And American families should support conservation efforts by visiting their local aquariums. *Robin Ganzert, Ph.D., is president and CEO of American Humane, the country’s oldest national humane organization. She is the former deputy director of philanthropic services at The Pew Charitable Trusts in Washington, D.C., and was senior vice president and national director of Philanthropic Wealth Management. The author of the book, “Animal Stars: Behind the Scenes with Your Favorite Animal Actors,” she is regularly featured on forums including CNN, The Today Show, Fox and Friends, NPR, and On the Record with Greta Van Susteren.